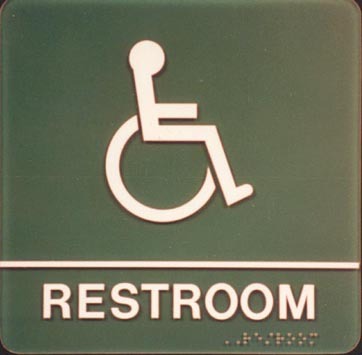 7 Kids and Us: Handicap or Family Restrooms are for just that! I have a huge pet peeve for people who use handicap restrooms or family restrooms! It drives me nuts when you see one person come out of a FAMILY restroom! It's for more than one person so that everyone can stay together and get their business done and leave not for some selfish person who just doesn't wanna walk the extra 5 feet to the normal stalls or wait the 5 minutes in line to get an empty stall. There is 100% no reason you should be in there! I know that even while I was pregnant I could wait and the times I couldn't pregnant or not people could notice I had to go and would let me pass. Then you have the handicap which are for people with wheelchairs, walkers, elderly not for single healthy want more room persons! I hate using the bigger ones even when I have 2 or more kids with me I have but at least I have others with me so the space is appreciated, but otherwise I sure do not wanna come out alone to someone waiting patiently in a wheelchair or so on I would feel like the biggest loser ever to come out alone and truly no reason to be in the stall. If you must use a bigger stall at least wash your hands out in the main area as well. I just don't think it's right to use things that are not meant for the average person, we need to learn to be more courteous.